During the arcade era of video games, Taito was a company that ranked up there with the greats of the gaming industry. While this position could be argued because of their relatively inconsistent output in comparison to their peers (that being said, the Darius series has been consistently excellent), what they did during that era of gaming is consequential to almost every other game made since. While Taito made games such as Araknoid and Elevator Action, their most famous game without a shadow of a doubt is Space Invaders. Tomohiro Nishikado's creation became so popular it caused a 100 yen coin shortage in Japan and garnered over $2 billion altogether. 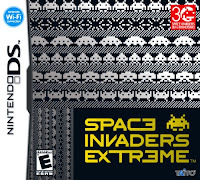 So for Taito's 30th Anniversary, they paid homage to the classic with Space Invaders Extreme, a game that surpasses the original in every possible way. 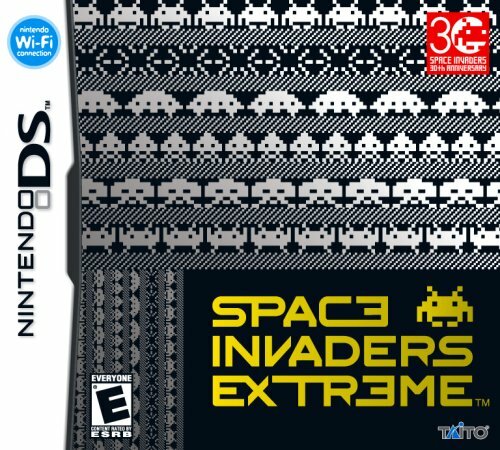 The statement may sound bold but Space Invaders Extreme and Pac Man: Championship Edition encapsulate how to re-imagine a game for modern audiences (Both games also had sequels then manage to improve on the games even further). Both games take the simple mechanics of each game and revitalise them into a snappier, fast paced setting while still remaining very accessible. If you've ever played Space Invaders then you know how the gameplay works. You are a small ship that has to fight against an alien horde that slowly lowers towards the ground. Extreme mixes this up by getting rid of the omnipresent shields in the original games and changing the colour of the aliens. When you hit four of the same kind of alien in a row then a powerup falls from that enemy to collect. This is important as it means you get the ability to pick and choose what abilities you want, along with adding a new layer of depth, timing your shots so you can continue your chain. The chaining system goes back to the idea of being easy to play, difficult to beat and hard to master. The game uses the dual screens to great effect with the top screen used for statistics and the bottom screen for gameplay. However what makes this idea great is the action remains continuous and it doesn't stop for one second (this was pushed to an even greater effect in Extreme 2). The score display screen does have uses in the game other than statistics. As with the original Space Invaders, during the battle between the descending aliens, UFO's scroll across the screen that can be shot for extra points. Extreme has these as well but once in a while a gold UFO will fly by. Shooting it causes a roulette to appear on the top screen for opportunities for even MORE powerups so there's a risk/reward system for whether you want to aim for the UFO and risk losing your chain or to opt for a much safer runthrough of the game. The score you get also affects how you progress through the game. After the first stage, if your combined score between the previous stages is high enough, you get to choose whether to go an easy stage, or a hard stage (Think of the reverse pyramid in Outrun 2), which allows multiple playthroughs so stagnation doesn't occur. The functionality of the dual screens really shines through in the boss battles. The first few stages start of as simplistic boss fights however as the game progresses you have to start incorporating tactics into your usual play style and learn to adapt to the patterns to survive. In fact the bosses work well as a microcosm of everything that's great about this game; adaptation and survival, risk/reward systems for new strategies and the large amount of fun you have from trying something new. It also helps that the gameplay is complemented by good graphics and amazing sound design, with each explosion, wave of enemies and laser blast adding to the music to create an experience reminiscent of Tetsuya Mizuguchi's Rez & Child of Eden. Shooters these days are ever more niché than they were in their "golden age" with all shooting games being categorised as to whatever CAVE's put out recently however Extreme is not only proof that there are alternatives to the bullet hell genre (such as Taito's own Darius series), but also that there is still a large amount of versitlity that the genre has to offer, a fact that will be expanded upon in Space Invaders Extreme 2.